Open pouch and break bait stations apart from each other. 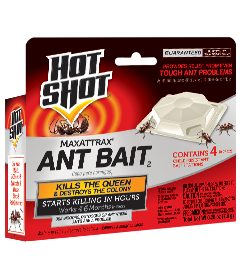 Place one bait station along each ant trail or in out-of-the-way places near walls, in cabinets, and under sinks and refrigerators. Heavily infested areas may require two or more bait stations for effective control. For continued indoor control, replace baits every six months or sooner if infestation is heavy or bait stations are empty. Open pouch and break bait stations apart before using. Place one bait station along each ant trail around the outside of homes. Place stations in areas inaccessible to children, pets and other non-target animals. Larger homes or homes with heavy infestations may require two or more bait stations to achieve control. For continued outdoor control, replace baits every three months or sooner if infestation is heavy or bait stations are empty. If partly ﬁlled: Call your local solid waste agency for disposal instructions.